Christy Lleras, a professor of human and community development, says that "soft skills" are better predictors of earnings and higher educational achievement later in life than having good grades and high standardized test scores. According to a University of Illinois professor who studies the sociology of education, high school sophomores who were rated by their teachers as having good social skills and work habits, and who participated in extracurricular activities in high school, made more money and completed higher levels of education 10 years later than their classmates who had similar standardized test scores but were less socially adroit and participated in fewer extracurricular activities. 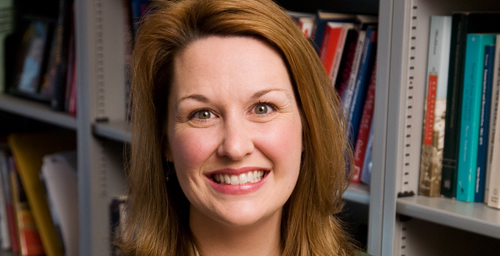 Christy Lleras, a professor of human and community development, says that "soft skills" such as sociability, punctuality, conscientiousness and an ability to get along well with others, along with participation in extracurricular activities, are better predictors of earnings and higher educational achievement later in life than having good grades and high standardized test scores. "That's not to say that academic achievement in high school doesn't matter - it does," Lleras said. "But if we only look at standardized test scores, we're only considering part of the equation for success as an adult in a global marketplace. Academic achievement is part of the story, but it's not the whole story. You've got to have the social skills and work habits to back those achievements up." With the generational shift from a manufacturing-based economy to a service- and information-based one, employers value workers who can not only boast about their GPAs and SAT scores, but are also able to get along well with the public and co-workers, Lleras said. "I think we've known this intuitively for a long time that employers are looking for something beyond cognitive skills," Lleras said. "Leadership now is not an individual thing, it's how well you get along in a team and get people organized." But thanks to the strict accountability measures of the No Child Left Behind law, struggling schools are increasingly cutting the extracurricular programs and activities that foster soft skills in order to focus almost exclusively on achieving adequate yearly progress on state-mandated standardized tests, Lleras said. Consequently, low-achieving schools are put in a bind: Measure up, or lose funding. Either way, it's a zero-sum game for students, Lleras said. "There's this pervasive idea that if we just teach and test the basic skills, students are going to do much better in school and in life," she said. "It would be great if we could just snap our fingers and tomorrow everyone could read, write and do math at grade-level. But an obsession with testing and routinized thinking doesn't foster the non-cognitive soft skills that pay off as an adult." Inadequate funding for education also has meant that many schools are not able to reduce class sizes or hire more qualified teachers, two important factors for "creating the academic and social environment that foster these kinds of soft skills in schools," Lleras said. high-quality teachers that help create good citizens and good workers and foster the kinds of work habits, behaviors and attitudes that we know employers value," she said. If high-stakes testing is the only remedy for low-performing schools, Lleras said, "then we may fail to help those students develop the soft skills they need to successfully complete higher levels of education and secure a better job in the labor market." Ironically, the original version of the No Child Left Behind law had a behavioral component. "NCLB did have this notion that there are other things going on in education besides testing, but it was grossly underfunded and targeted drug, alcohol, tobacco and violence prevention activities," she said. Lleras sees access to high-performing schools not only as an educational issue, but also as a social justice issue. In the course of her research, she discovered that participation in fine arts programs was associated with "significantly higher earnings" for African-American and Hispanic students 10 years later, yet those students often attended schools with fewer opportunities for fine arts participation. The same measure had little effect on the earning power of white students. If we care about those low-achieving schools and their effect on students, it's imperative for schools and educators to go beyond No Child Left Behind, which is "only about testing," Lleras said. "Most of our students don't go on to college, and our young adults today are entering a workforce that's very different from what it was 30 years ago," Lleras said. "It's a very tenuous, volatile market, especially for workers with a high school education or less, and our schools are failing students by not providing enough opportunities to develop the skills, habits and knowledge we know employers are going to reward." So what can parents take away from her research? "I think that incentives are very important, particularly for adolescents," Lleras said. "Teens need to see that their efforts in high school matter and will eventually pay off. This gives parents evidence they can use to talk to their kids about the importance of working hard, getting along with others and participating in extracurricular activities."